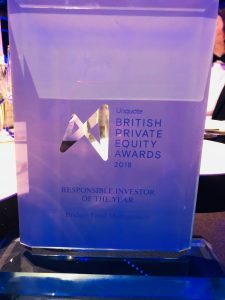 We’re delighted to announce that Bridges has been named ‘Responsible Investor of the Year’ in this year’s Unquote British Private Equity Awards! The award recognises managers who go beyond typical ESG requirements, thinking carefully about how they can make a positive impact on people or the planet. Bridges was honoured for incorporating impact into every aspect of our investment process, and for sharing what we learn for the benefit of the broader market. In the last year, this has included facilitating the Impact Management Project, a global initiative involving over 2,000 industry stakeholders to build consensus around how we talk about, analyse and measure impact. The award was partly decided by a public vote, so a big thank you to everyone who voted for us!